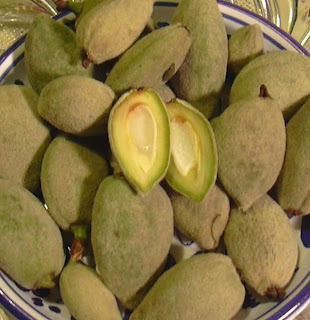 Green Almonds: Having read about fresh, unripened or immature almonds in obscure and uber gourmet food magazines and articles for years - I finally found the object of my peculiar interest. They are difficult to find in the United States especially on the East Coast. Dibruno's at 18th & Chestnut had a basket full in the produce area. I hardly ever go into that store these days, the foods and cheeses are too tempting and indulgent and the prices too steep for my wallet. I was actually looking for a large bucket of Cerignola Olives Dibruno's carried about a year ago in the "bulk" area. No olives but a chance encounter led me to discover these herbaceous and citrusy green almonds. I bought a pound, then decided to search the Internet for the best way to serve them. The suggestion at Dibruno's was to rinse the almonds, dip them in salt and enjoy. It sounded so simple I was convinced there had to be some other method. A few people suggested sauteing or frying them, but that wasn't an option - too fattening and I was afraid the little fruit-nuts wouldn't hold up at the cocktail buffet table. A couple of websites and blogs suggested just serving them with oil and seasonings or cracking them open and extracting the raw almond. The latter works better with slightly more mature but still unripened almonds, once the nut meat turned from gelatinous to a more recognizable raw nut. The serving suggestion was written in the April 22, 2007 issue of New York Magazine. Rinse, dip in olive oil and then into salt seasoned with a Japanese chili mixture. I opted to use one of my house-made Mexican Seasonings with smokey chipotle kick. The verdict at our swinging cocktail party - "Very different; Unusual; a first for most people; highly original." Oh - and they tasted good too. Persian Cucumbers: For those of you who like cucumbers but find cucumbers don't like you (ahem, they um, like to repeat themselves...) You might want to seek out these little gems. 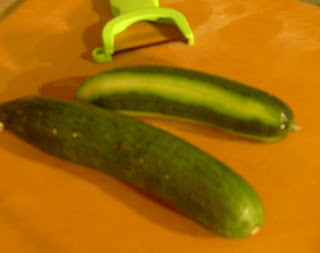 Persian Cucumbers are smaller and thinner than regular cucs, they remind me of a cross between a Kirby Cucumber and an English Seedless Cucumber. They don't need to be peeled as much; there isn't a waxy coating on the skin. Since they are small, about the diameter of a quarter and 6 inches or smaller in length, the seeds are digestible, you won't have to scoop out the innards. Wash, cut in half length-wise to make two even half rounds. The cut them into small half moons. One of the assistant teachers at our preschool, Hannah, said she likes to use them in Israeli Salads, or in Tabbouleh. The cucs are tiny enough to save time chopping them into small bite sized or minced pieces. I bet they would grate perfectly for a Tzekki Sauce - the Greek Yogurt, Cucumber, Lemon, Mint and Garlic Sauce you get on the side with a Gyro or Shwarma. MMM!